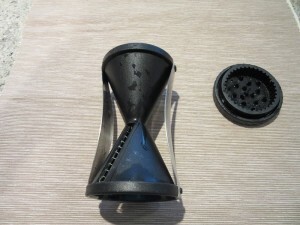 It’s becoming more and more apparent that one of my life’s goals is that no kitchen gadget shall go unpurchased! 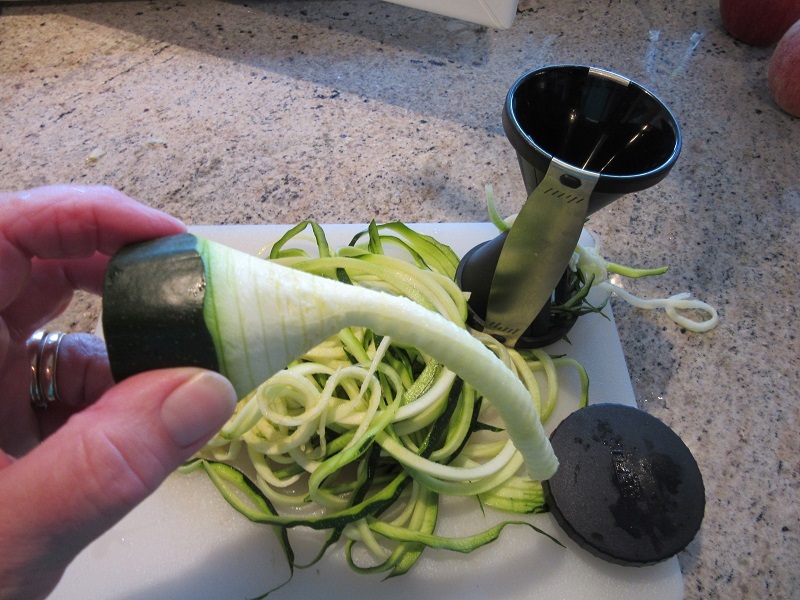 When I first saw a Zucchini noodle maker posted by a friend of mine on Facebook, I knew instantly what I’d be purchasing next. And boy oh boy is this little guy some fun! 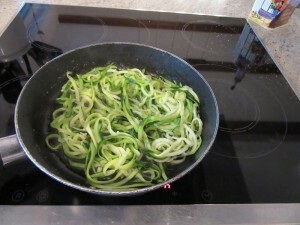 The idea is to use these zucchini noodles in place of pasta to keep your Carb intake lower and thus, lose a pound or two. Hahahahaha, says I! My first experiment ended happily as I sauteed the zoodles in garlic, butter, olive oil and finished the dish off with 1/2 cup of grated Parmesan cheese. Sure there were lower Carbs but certainly not fewer calories. However,they tasted awesome! 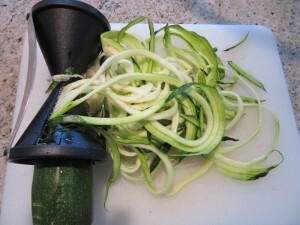 The zoodle maker is really simple to use. Just choose whether you want fatter zoodles or thinner zoodles. Insert a zucchini into the opening and twist away. So simple to use. Even I had no trouble! This is what I ended up with after running out of zucchini. A limp zoodle. Made me laugh! Can’t wait to see what else I can find to add to my collection of fine, fun gadgets! I have one of these and haven’t tried it yet. (I’m one of those people that do NOT try things as soon as I get them home, their presence has to sort of grow on me, and I want to savor the accomplishment of just obtaining it, first, lol.) However, now you’ve really left no questions, and am ready to try it! (The seeds down the center were one thing I was pondering.) What the heck, I usually slice the zuchini, then saute in garlic and butter, like you did. Same taste different shape. Next, I’ll try them in regular pasta recipes, and see how I like zucchini that way. Heck, I already love spaghetti squash as a spaghetti substitute. Thanks for the encouragement, Karen! Hi Sarah, Believe it or not, the Zucchini noodles do taste “different” than sliced zucchini. I can’t explain it, it just is. We used the zoodles with spaghetti sauce and loved them! Using smaller zukes eliminates the seed issue, I think anyway. I’m eager to hear your assessment, so please, try away!